Waterman hosts an annual event, July 21st this year, called "Summerfest and Waterman Lions Club Tractor Show" in the Lions Club Park, just south of U.S. 30. This year something new will be added: a "Soybean Adventure" from 9:00 a.m. to 3:00 p.m. Summerfest goes on into the evening with food, beverages, music and fireworks. Illinois has been the top producer of soybeans four out of the last five years. Festivals exist to promote pumpkins, wine, strawberries, rhubarb, so why not soybeans? Our organization could promote an annual soybean festival in our area, bringing new attention to our Visit 30 region (Lee-Shabbona-Waterman) and new people into our communities. This year there is an opportunity for WSBA members to participate in a Soybean Adventure fun-focused area. Your business or organization could participate by creating a soybean-related game or informational display that has something to do with soybeans. Think of it as a business/community expo with a soybean theme. Besides your soybean-related activity or display, you would also showcase and advertise your business or organization at your booth. It would be perfect if your business can somehow show a link to soybeans, but if not, you can just be creative and show a soybean topic people can relate to. Soy sauce - what is it, how is it made? Edamame - how does it taste, how is it made? Tofu - what is it, is it a healthy food? Are there soybean ingredients in some ice creams and beauty products? A toy tractor display of soybean production would be informative! Great creative with your own ideas or we can provide a soybean promotional idea for you. Your business could give a prize, promotional object, or gift certificate to participants. You can also sell items which are pre-approved by WSBA and the Waterman Lions Club. This is an opportunity to promote what you do and contribute to an event that may grow into a stand alone festival sponsored by WSBA! 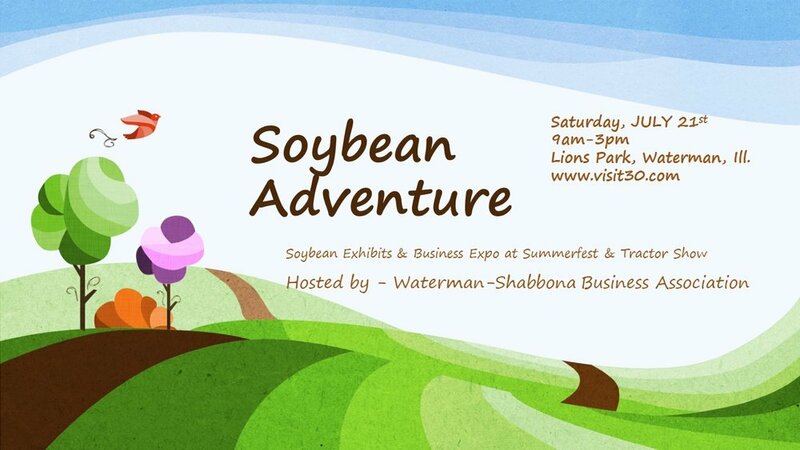 Call me (cell: 815-739-1178 or 815-264-3268) to reserve space at the Soybean Adventure and discuss your promotional ideas. Questions are always welcome! Our next WSBA meeting is July 11th at 6:00 p.m. at Waterman Winery. We hope to see you there! SHABBONA – The Waterman-Shabbona Business Association hosted a ribbon-cutting to celebrate the new location of Foster’s Financial Management, LLC and Foster’s Tax Accounting, LLC at 311 W. Comanche Ave along US Route 30 in Shabbona. Both businesses are co-located at the location which has four full time employees offering diverse financial services to their clients. Since 1998, Patty Foster of Foster’s Tax Accounting, LLC has provided tax and accounting services specializing in tax preparation for businesses and individuals, as well as bookkeeping and payroll services. Charlie Foster of Foster’s Financial Management, LLC provides investment services, planning, and advice and has been in business since 2006. Securities offered through Cetera Financial Specialists LLC, member FINRA/SIPC. Cetera is under separate ownership from any other named entity. For more information about Foster’s Tax Accounting, LLC or Foster’s Financial Management, LLC, contact them at 815-824-8399 or www.fostersfinancial.com. Red Ribbon Cutting with Waterman-Shabbona Business Association members at Foster's Financial Management and Foster's Tax & Accounting celebrating their new location in Shabbona. Congratulations Foster's Financial Management and Foster's Tax & Accounting! 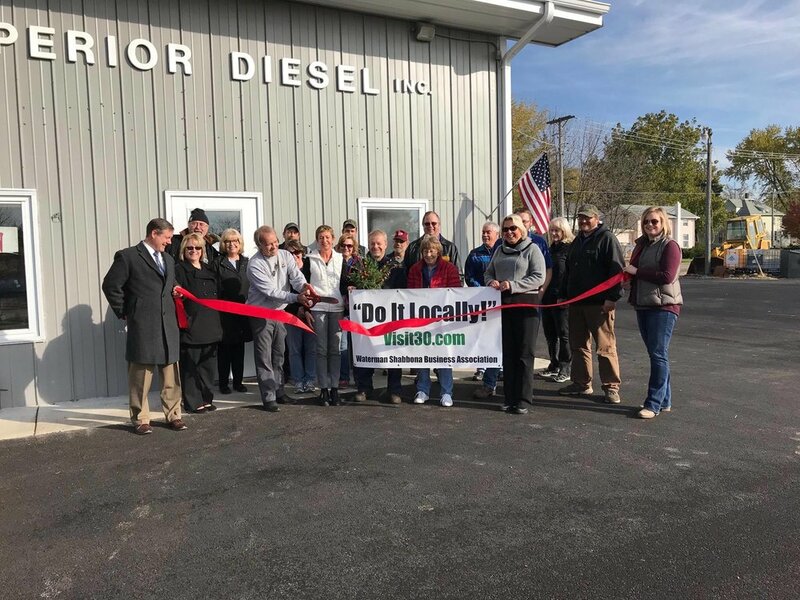 Red Ribbon Cutting Nov. 3, 2017 with Waterman-Shabbona Business Association members at Superior Diesel celebrating their facility improvements. Superior Diesel's new paved parking lot and complete exterior paint job look terrific on Hwy 30 in Waterman. 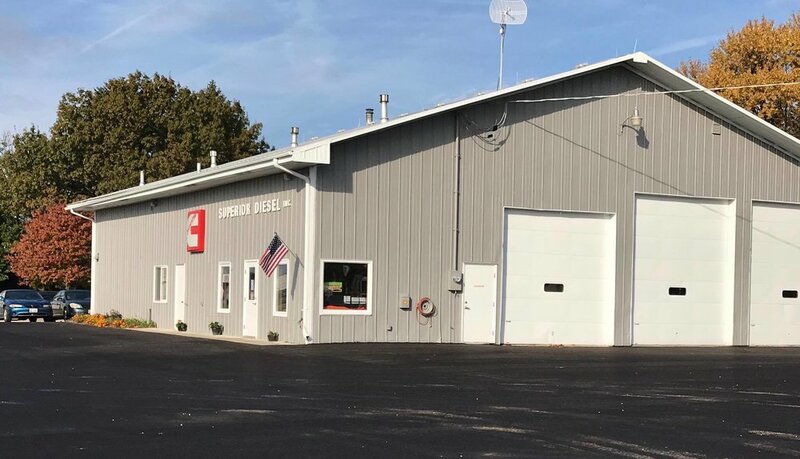 The public is invited to join the Waterman-Shabbona Business Association in a Red Ribbon Cutting for Superior Diesel! We are celebrating their great facility improvements! There will be a Red Ribbon Cutting on Friday, November 3rd at 10:00 a.m. at 350 E. Lincoln Highway, Waterman, IL. We hope to see everyone there! The Village of Shabbona's Economic Development Committee has been working with Northern Illinois University's Center for Governmental Studies to conduct a survey of area business owners, residents, and visitors. Survey results will help to identify business and tourism development opportunities and determine the feasibility of those opportunities. Paper copies can be completed at Resource Bank, Village Hall, Flewellin Memorial Library, Pokanoka’s Café, Lakeside Bait & Tackle, Wisted’s Country Market, Shabbona Café and in Shabbona Lake State Park. All responses will be confidential and the compiled results will be shared this fall. The survey is a component of an economic development planning grant that was provided by the DeKalb County Community Foundation. The fourth annual DeKalb County Barn Tour will take place from 9 a.m. to 4 p.m. Saturday, Aug. 12. Livestock and grain farms, as well as repurposed barns, including a winery, are included in this year’s event. This unique opportunity to tour local historic barns is sponsored jointly by the DeKalb Area Agricultural Heritage Association and the J.F. Glidden Homestead and Historical Center, DeKalb. This year the tour features barns in the Waterman-Shabbona area. The self-driving event includes a guided tour at each of 10 barns, with demonstrations, displays and family activities along the way. May WSBA Board Meeting - Join us at the Waterman Winery! Wednesday, May 10th, 2017 at 6:30 p.m.
We want to invite all current and past WSBA members, any new or existing business in the Waterman-Shabbona-Lee area are invited to attend to learn more about WSBA and our upcoming plans and events. We are planning a float to feature businesses and attractions in the area summer parades and also planning an early fall event we would like everyone's input on. Note: At the stop light in Waterman, go north on Elm Street, which becomes Waterman Road. Pizza and Beverages will be available at the meeting. Winery is on East side of Waterman Road, ½ mile north of Lee Road. All area businesses, past and present members are welcome! We also want to reach out to home-based businesses and independent consultants. If you're interested in promoting your business and the Waterman-Shabbona-Lee communities as a great place to live, work and play, we hope to see you there. The more the merrier! Bring a business contact with you! The Waterman Shabbona Business Association kicked off their 2016-2017 Election year at Houlahan's Tavern & Grill. Local Business and Community members were invited out to receive knowledge on how the WSBA and the website visit30.com could help them and our community prosper and get us on the map for an avenue of tourism information. The newly appointed Board and Trustees were named as the following: President John Ecker of Peak Estimating, Vice President Kathy Sands of The Camp Store at Shabbona State Park, Secretary Linda Swenson of Century 21 Elsner Realty, Treasurer Michelle Janco of Resource Bank. Shabbona Trustees: Melissa Joyce of Prairie Crossing Living and Rehabilitation Center with A Supportive Living Community, Scot Ostrander of Screamer's and Lesa Clanin of Broker Signature Real Estate. Waterman Trustees: Frank Atkinson of ASAP Welding, Terrie Tuntland of Waterman Winery and Vineyards, and Christina Bystry-Busch of Simply Irzstbl. "This was a great start to a new beginning for our community. What a great turnout with such caring members that want to get involved in this project" says President John Ecker. Shabbona Cafe Ribbon Cutting with the Waterman Shabbona Business Assoc. Jerry Foster presents a certificate to Leon Ardelean as appreciation for all the years of service and the power behind combining the 2 communities together. Thank you Leon for your dedication and service to the community and WSBA.